'Parell. The Government House, Bombay'. Lithograph by Day & Son from Sir Harry Darrell's China, India and the Cape London, 1852. Proof. bl.uk > Online Gallery Home	> Online exhibitions	> Asia, Pacific and Africa Collections	> 'Parell. The Government House, Bombay'. 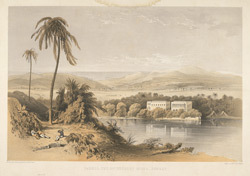 Lithograph by Day & Son from Sir Harry Darrell's China, India and the Cape London, 1852. Proof. Coloured lithograph of the Government House at Parel in Bombay by Day & Son after Sir Harry Francis Colville Darrell (1814-1853) from his 'China, India and the Cape' published in London in 1852. Parel, originally an island, is located in the northern part of Bombay. The building shown in this view was built by the Jesuits under Portuguese rule in the 16th and 17th centuries. It was used as a country retreat for the English Governor of Bombay from 1719. In 1829, the building officially became the Government House. However, in the 1880s the Government House was relocated to Malabar Point.